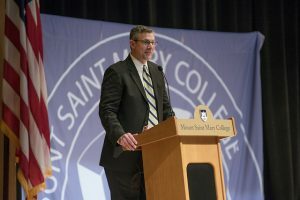 With the holidays long gone and winter still in the air, the students, faculty and staff at Mount Saint Mary College have a fresh new term ahead of them. The spring semester has already begun on a high note. The freshmen residents were finally able to return to Sakac Hall after the mold crisis that took place early in the 2018 fall semester. Seniors are counting down the remaining days until their commencement ceremony in May. And last but certainly not least, the winter sports season is drawing to a close, making way for the spring athletes and their seasons. MSMC President Jason Adsit is also entering the new semester in radiant spirits. He has high hopes to bring about even more success for the school, and so he is more than ready to put his leadership skills to the test to drive the semester. Recently, Dr. Adsit organized a new initiative to stimulate more outreach throughout the Mount community. In order to accomplish this goal, he will be hosting public forums to give students, faculty and staff the chance to get any of their concerns resolved. Striving to make these forums a reoccurring engagement, determined to advance the Mount to levels that have never been reached before, Dr. Adsit encourages all to join him in his vision for MSMC and is confident that this plan will help the school thrive.